This option allows the user to select the duration of their ad. It will add a drop-down list in the add form including each options enabled in the administration. To add, edit or delete durations in this list, go to the administration of your website and click on the 'Durations' link of the PaidSystem dashboard. The table lists the various options already present and whether they are enabled. 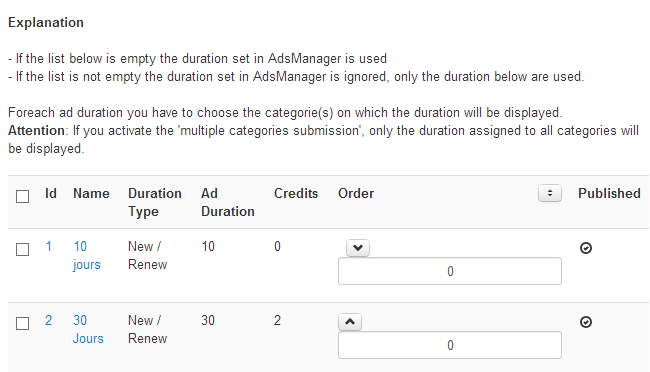 Tips are displayed above the table to explain the AdsManager behavior for each option. To change or delete durations, select the option in question and click the corresponding button on the top of the window. To add a new option, click the 'New' button. Name: Option name as it will be displayed in the list. Duration type: The option will appear for the selected ad's type. 'New' means new ad, 'Renew' means renewal ad. Ad Duration: Duration of the ad in days, or unlimited. Credits: Option price in credits, free if left blank. Published: Allows you to enable or disable the option. Category: Categories in which the option will be available. Once the form is validated, the newly created option will be displayed with others.